The OMG-ULTRACOMM2-PCI provides two field selectable RS232/422/485 serial ports for control and automation applications. Configure both ports as RS232 for standard serial COM: port requirements. Choose RS422 for long distance device connections at up to 1219 m (4000') where noise immunity and high data integrity are essential. Multi-drop up to 31 RS485 devices to each port in a RS485 bus for automated data collection. Mix the interfaces in any of the interface combinations to provide maximum flexibility to your communications. 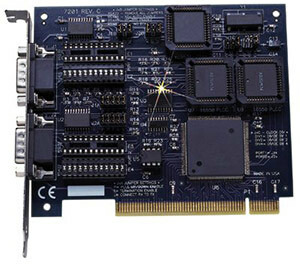 In both RS232 and RS422 modes, the card works seamlessly with the standard operating system serial driver. In RS485 mode, our auto enable feature enables the RS485 line driver during character transmission and disables the driver afterward allowing the standard COM: driver to be utilized for RS485 communications. A serial utility CD is supplied with the OMG-ULTRACOMM2-PCI which includes all the Windows tools necessary to verify the installation and operation of the board. WIN XP/Vista/7 drivers are included as well as support for Linux. The drivers provide IRQ sharing, advanced UART support and serial diagnostic utilities. 참고: Comes with complete operator's manual and serial utility disk.